I love pizza. There is something about a crispy crust with gooey cheese that makes my mouth melt. The downside to getting takeout pizza is that I cant always get the topping combinations or the crust type that I want. Plus, the cost of getting takeout pizza doesn't help the family budget. Recently we have been making our own pizza at home. With Pillsbury Artisan Pizza Crust with Whole Grain, my family can have great pizza made at home for a fraction of the cost. When it comes to making pizza at home, you can make pizzas for everyone. Personally, I like my pizza topped with tons of veggies. For me, a homemade pizza is an easy way for me to eat my veggies. With a little sauce and a dash of mozzarella, I've got a great dinner. My kids are different. The boys want pepperoni and cheese. Occasionally, they will venture beyond their two favorites. What I've done to get them to try something new is that half of their pizza needs to have a new or different topping. One time it can be mushroom and maybe the next time it can be green peppers. It is an easy way for the kids to expand their tastes . Plus, by making it at home, I don't feel bad if not every slice is devoured. I'm not sitting them calculating the lost dollars when the kids declare that they are never eating another olive again! Are you ready to try the great taste of Artisan pizza at home? Pillsbury has a great artisan style pizza crust. The added bonus to this at home version is that the Pillsbury whole wheat crust has 16 grams of whole grain per serving. We all know that whole grains are important to our diet. With a yummy pizza that the entire family will enjoy, you can feel better about making sure that your family is getting additional whole grain in their diet. 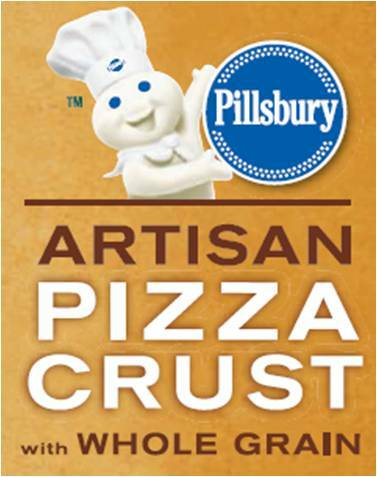 Are you ready to try the Pillsbury Artisan Pizza Crust with Whole Grain? Head over to the refrigerated section of your local grocery store to check it out. Plus, you can download a coupon for $1.25 off one package. Want even more? How about a Pillsbury Artisan Pizza Crust with Whole Grains prize package? What can you win? Hawaiian pizza with cheese, pineapple and canadian bacon. We like veggie supreme pizza. We like an extra cheese pizza! I love sausage, pepperoni, mushrooms and peppers on my pizza. Please accept my entry. Thank you. We like Pepperoni and Green Pepper Pizza. We like pepperoni or black olives. Spinach, mushroom, and garlic sauce is the favorite in our house. Thanks. I love a pizza with pepperoni, black olives, onions, peppers, lots of cheese baked well. Salad on pizza with ranch dipping sauce. I love Hawaiian! Thanks for hosting! We created a shrimp and cheese pizza that's to die for! My family loves it! We love Hawaiian Pizza with lots of extra cheese and Canadian bacon. Pepperoni, peppered salami, red onion, extra cheese. We like pepperoni with mushrooms and onions. We like spicy sausage and roasted tomatoes. Pepperoni, mushroom & green olive! My kids just like plain. Usually just ground beef or pepperoni. Pepperoni is the only one that everyone will eat. My family loves ham and pineapple pizza. Pepperoni, cheese and green peppers. We like to make buffalo chicken pizza. Family loves plain cheese pizza - I like spinach, feta cheese and diced tomatoes. Veggies and uncured pepperoni with lots of artisan cheeses. Sounds like pizza night with the family just became easy! my favorite is pepperoni and mushroom pizza!!! Our favorite is bacon cheeseburger pizza. extra cheese - plain but tasty! Mushroom, green pepper and extra cheese! I love a classic pepperoni! We like pepperoni and green pepper.